The Rising Phoenix Dancers model their animal print costumes, which give a rather different meaning to the term "tribal." 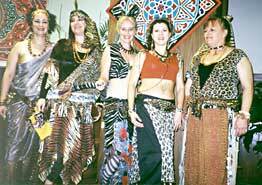 Left to right: Akasha, Sherezzah, Joani, Adena, and Katina. Here, the Rising Phoenix Dancers perform to a Neanderthal-sounding number, which was what inspired the costumes in the first place. Both photos taken at Oasis Dance Camp-South 1998.